Description: This controller is not compatible with Nintendo GameCube games. Box Text: Simple. Intuitive. Easy to use. The Classic Controller is designed to work together with the Wii Remote controller on the Wii video game system. Created for accessibility and comfort, the Classic Controller blends design elements from game systems such as the NES, Super NES, and Nintendo 64 providing seamless play control for a whole range of games. The Classic Controller is primarily used for playing Virtual Console games on the Wii Shop Channel. Also look on the back of Wii Game Disc packaging to see which games use the Classic Controller. 07-24-2017 pzeke Description This controller is not compatible with Nintendo GameCube games. 07-24-2017 pzeke Box Text Simple. Intuitive. Easy to use. The Classic Controller is designed to work together with the Wii Remote controller on the Wii video game system. Created for accessibility and comfort, the Classic Controller blends design elements from game systems such as the NES, Super NES, and Nintendo 64 providing seamless play control for a whole range of games. 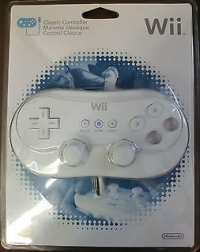 The Classic Controller is primarily used for playing Virtual Console games on the Wii Shop Channel. Also look on the back of Wii Game Disc packaging to see which games use the Classic Controller. 07-24-2017 pzeke Box Text Simple. Intuitive. Easy to use. The Classic Controller is designed to work together with the Wii Remote controller on the Wii video game system. Created for accessibility and comfort, the Classic Controller blends design elements from game systems such as the NES, Super NES, and Nintendo 64 providing seamless play control for a whole range of games. The Classic Controller is primarily use for playing Virtual Console games on the Wii Shop Channel (not compatible with Nintendo GameCube games). 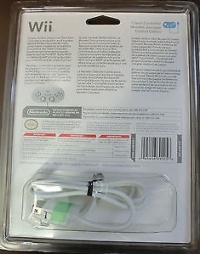 Also look on the back of Wii Game Disc packaging to see which games use the Classic Controller. This is a list of VGCollect users who have Wii Classic Controller [NA] in their Collection. This is a list of VGCollect users who have Wii Classic Controller [NA] in their Sell List. This is a list of VGCollect users who have Wii Classic Controller [NA] in their Wish List.